What flooring should I use in my kitchen? It's always one of the big questions on the lips of more or less every new homeowner (or pre-existing occupant looking for a more aesthetically desirable kitchen setup for their home). Without a doubt, the kitchen is one of the most important spaces in the house—it's where we come together over shared meals and good times, where we prepare and store our foods, and for some, where we unwind and relax over domestic tasks and duties. Sure, a key part of the kitchen comes down to the hardware we use; the appliances, the colours, the lighting and the trimmings. But one thing that deserves crucial consideration when it comes to the kitchen (something too often overlooked) is the flooring. Tiles or floorboards? Carpet or stone? What about the patterns and tones? There are so many questions to be asked, and answered, about the kitchen floor, and a little assistance can really go a long way. 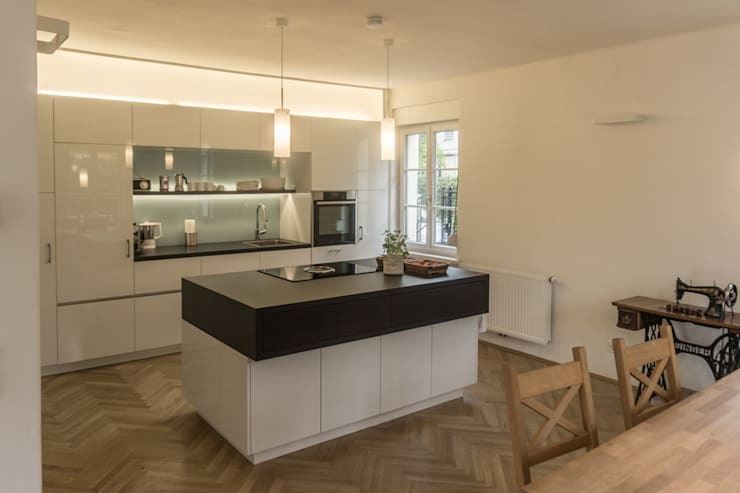 Today on homify, we're helping you on your way with our handy guide to kitchen flooring: a neat look at some of the more compelling range of kitchen flooring options available to you. 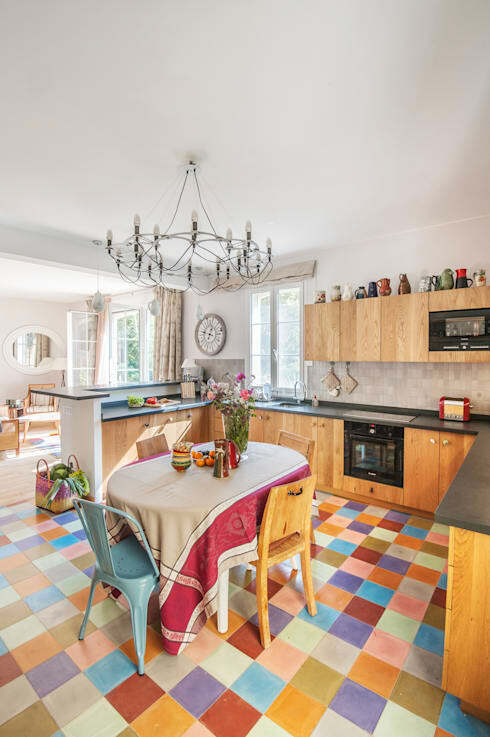 We often talk about interior design-related things like the kitchen floor' in a singular sense, and assume that there's only one solution to cover our many different household needs. Depending on the style and configuration of your home (and the kitchen within it)—not to mention your own unique vision for how it ought to look, feel and function—it may be a wise idea to open your mind a little as to what's really possible. For example: what if one material is not enough? This scene here illustrates our case in point more than adequately. While a clean, fresh outlay of marble flooring would have been one option for these occupants, they instead opted to keep things interesting with a delicate contrast of two very different materials. Yes, the brilliant marble coats the bulk of the floor here and shines supremely, but it works with a timely and neat inclusion of wooden floorboards, cordoning off the eating area, a juxtaposition with flair, turning an otherwise unison kitchen floor into a multi-material stunner. For that element of understated class and refinement, you can't beat tiles in the kitchen. Tiling remains one of the most popular go-to kitchen flooring styles for modern interiors, and it isn't hard to see why. As well as offering a wide variety of unique materials, patterns and tones to choose from, tiling enables that one thing we all crave in our kitchens: un-compromised cleanliness. 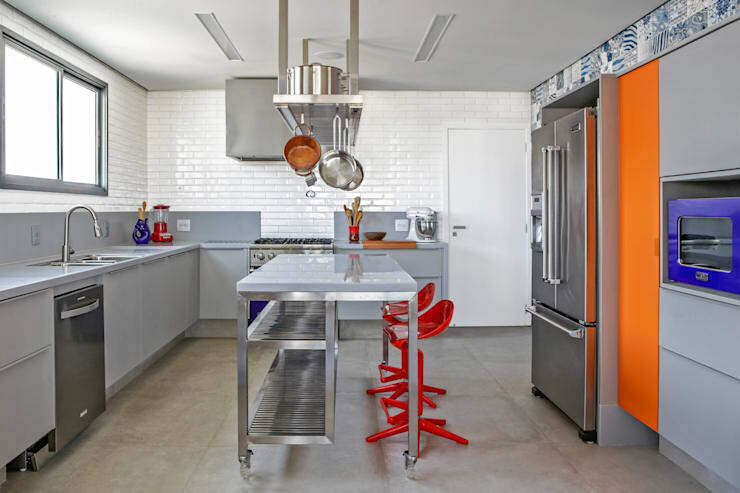 Smooth, tiled floors equal a kitchen instantly conducive to effortless clean ups—as well as a neat aesthetic touch. 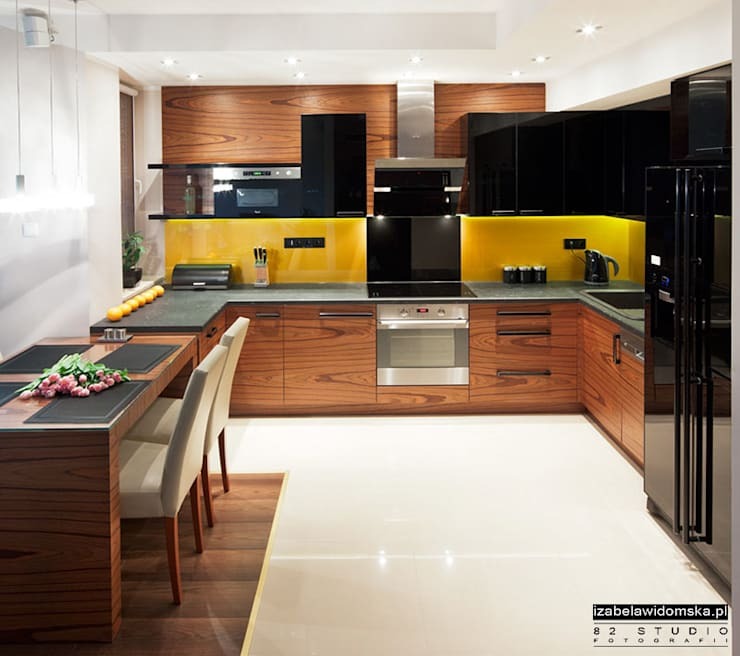 Here in this example we see how tiles blend effortlessly into a classic, modern and very fine looking kitchen setup. Recessed ceiling lights shed ample illumination onto a sophisticated, fresh, yet very uncluttered preparation area. Keeping all this grounded: the selection of fine looking stone wash tiles, a point of relaxed and understated interest in a room that demands exactly that. Choosing the right kitchen floor—tiles or otherwise—can be a tricky thing to achieve - why not have a chat to a professional and gain a little extra advice and guidance? All this talk of materials! What about the patterns? It's always important to consider the full range of options in front of you when it comes to kitchen floors—it could be the case that a particular material only really sings when it's laid out in a particular pattern or style. Take this neat example on board: a cute, comfortable and contemporary kitchen is made to look extra fabulous with the choice of wooden floorboards, yet the designers go a step further with it. Rather than customary single slat floorboards, they've gone with a wonderful parquet style, giving the kitchen depth of texture and an added sense of class. Very neat. Speaking of mixing up your choice of patterns and styles, never forget just how much colour can be an interior designer's best friend too. If it suits the home, the kitchen and your own vision for how a kitchen floor ought to look, why not go for broke with your choice of tones and hues? The designers of this wonderfully vibrant kitchen have certainly taken this sage advice on board. Here's a kitchen floor that holds court with personality and flair—in fact, the floor is really the star character in this setup. Fusing a plethora of coloured tiles together gives this space an eclectic, warm and almost cottage touch. Ultimately, it's fun and full of life: what more could you want out of a kitchen floor? With the rise in foodie culture throughout the world in recent years, more and more people are taking up a commercial-style setup in the comfort of their own homes. Commercial kitchen style can be a great one: smart, sharp and full of stainless steel sparkle. But what about the floors? As we see in this great example, a single slab of concrete, polished with treatment, makes the perfect addition to a commercial-oriented, yet still very domestic setup. The tone works to a tee, while the material itself—the simplicity of it—really brings this space together. Thoughtful, and ultra successful. However, when a single material can't be done without, when your kitchen craves solid and focussed treatment from just one option, you can scarcely settle on a better and more robust option than wood. 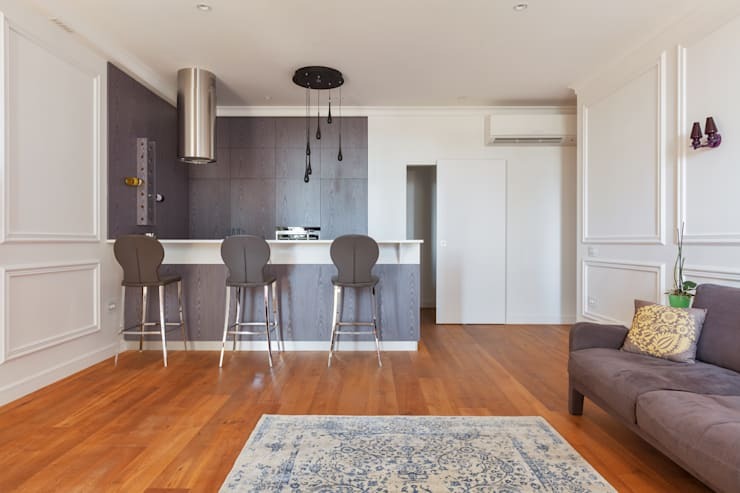 Wooden floorboards are not only tough wearing and solid, but they give a kitchen an added element of refinement and character that no other material can achieve in quite the same fashion. Even if the rest of your home's flooring is comprised of completely different materials, floorboards can really work wonders in the kitchen: take a look at the fantastic kitchen in this scene for an instant examplar. Here, a light and airy, open plan kitchen achieves so much with the designer's choice to work with polished, natural wood. Wooden floorboards are versatile and terrific: even a contemporary kitchen space like this benefits from an extra element of rustic depths and charm. Did you enjoy that Ideabook? 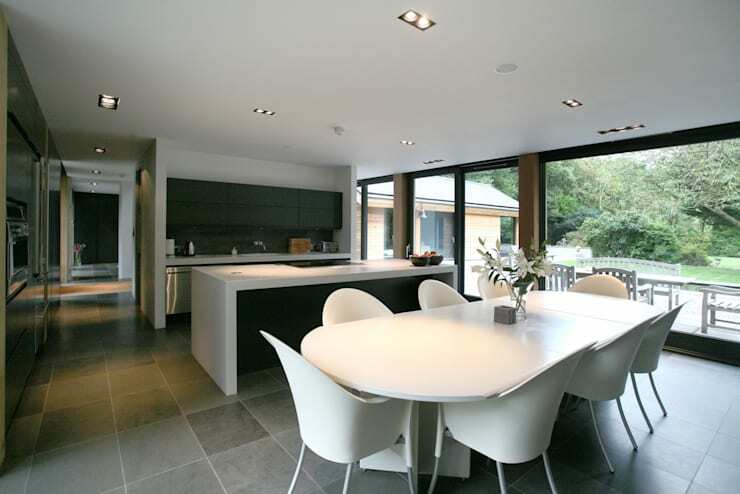 Why not delve deeper into the fabulous world of kitchen design with Kitchen Simplicity? Do you have any other handy kitchen flooring tips for our readers? We’d love to hear from you in the comments section below!